I've had the Suntrust Delta Debit Card for some years now. 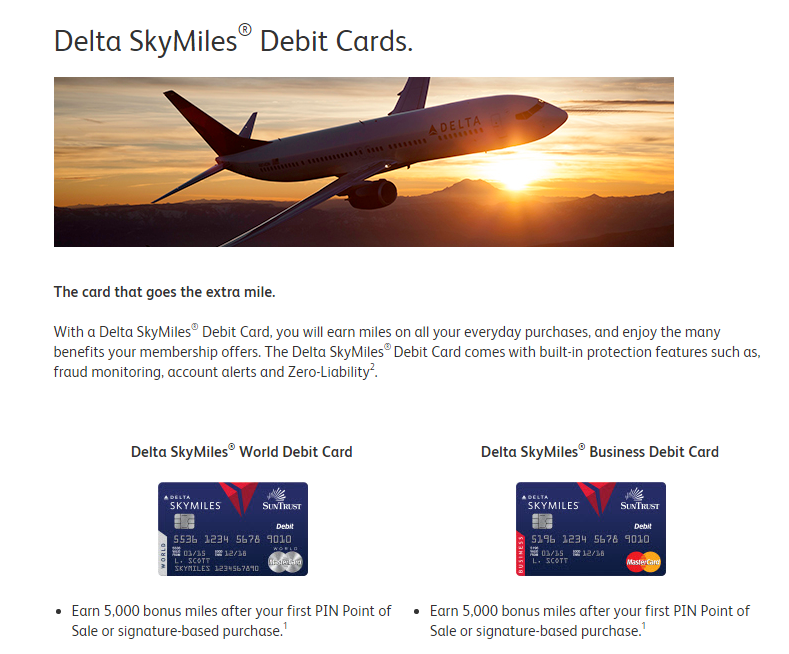 It used to be a fantastically lucrative card: for an annual fee of $75 you could earn a practically unlimited number of Skymiles for making PIN-based purchases. I earned a LOT of miles this way. The card really was much too good of a deal, and it hasn't been available to new applicants for quite a while. Suntrust recently hobbled the card, which was a real heartbreak for those of us who'd gotten one when it was still available. But, interestingly, Suntrust has now revived the card for new applicants and is even offering a sign-up bonus (a modest 5,000 Skymiles). The value proposition is much lower with the new restrictions, but it could be interesting to some folks. Under the new terms, a Delta Debit Card attached to a Signature Advantage checking account earns 1 Skymile per dollar spent, including PIN-based transactions. However, you are limited to earning 4,000 Skymiles per month. 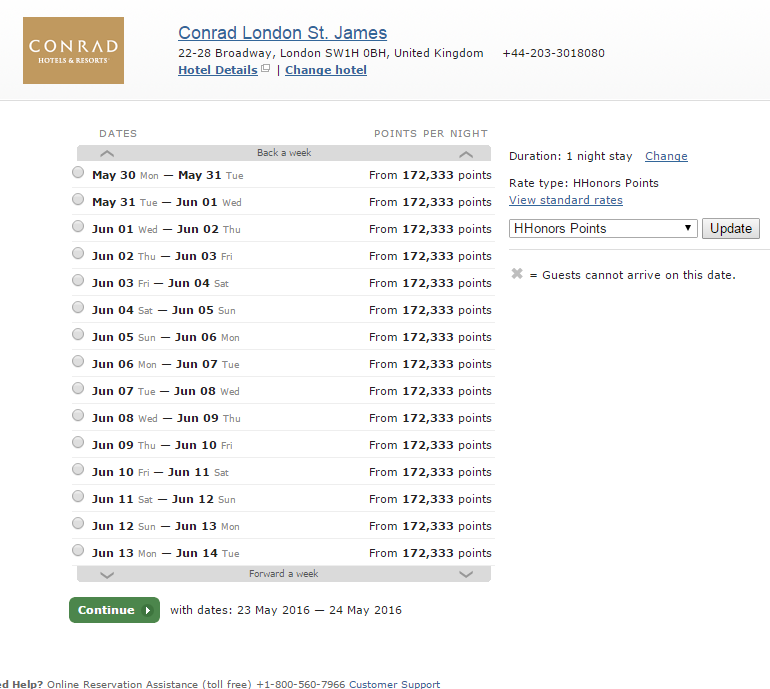 That's not too bad, since I generally value Skymiles a a little over 1CPM. Given the hard upper limit on earning, I probably wouldn't jump at this deal myself. Still, it's worth considering, particularly if you live in Suntrust's service area. Of course, it you happen to already have $25,000 on deposit with Suntrust, I'd say jumping on this card would be a no-brainer. BUT, there doesn't appear to be any reason to do so, as the Ts&Cs state that: "Enrollment and all bonus miles are only applicable once perclient/checking account and SkyMiles number." The terms also indicate (but don't unequivocally state) that the monthly earn limits are per account, not per card. UPDATE to the UPDATE: Oooh. This just got more interesting. 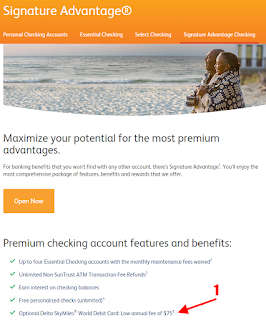 Via chat, a Suntrust agent confirms that the limits are "per card" limits, NOT "per account" limits. That means a single joint checking account could carry up to three cards (which must be linked to three separate Skymiles accounts) and earn 4,000 miles per month PER CARD. I'll be interested to see if this pans out. If it does, joint account holders could each earn 48,000 miles per year on without each having to deposit $25,000. The agent also confirmed that that secondary Skymiles Debit Cards would not incur an additional annual fee (but would not be eligible for an additional cap) if both cards were linked to the same Skymiles account. For the most part survey's for points aren't a particularly lucrative, and this one's no different. 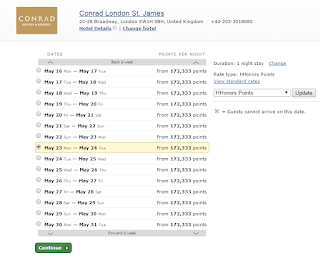 It's a very quick survey I discovered via Lucky (via PM&M) that offers 100 Marriott points for about 30 seconds work. 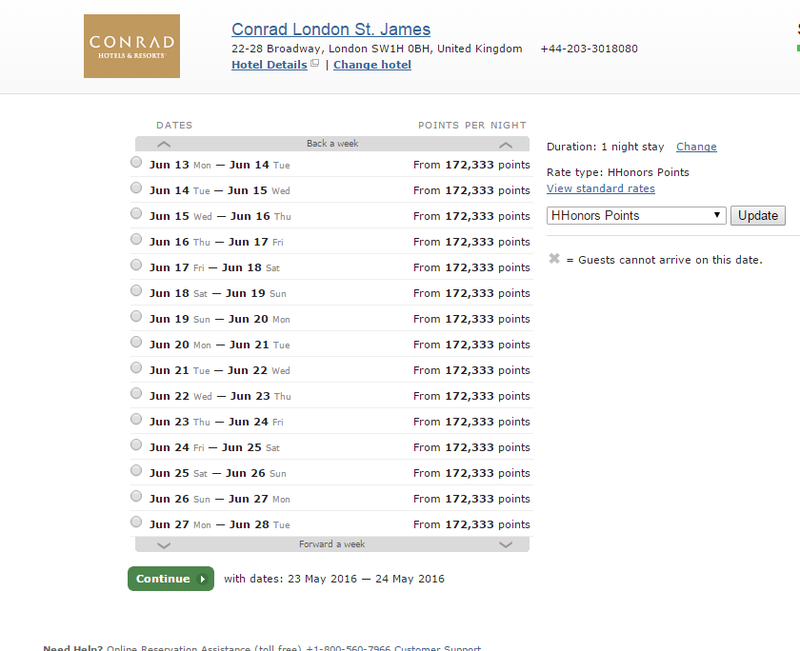 That's way less than a buck's worth of points, but if you don't have a lot of activity with Marriott, it coudl be useful for extending the life of your Marriott balance. 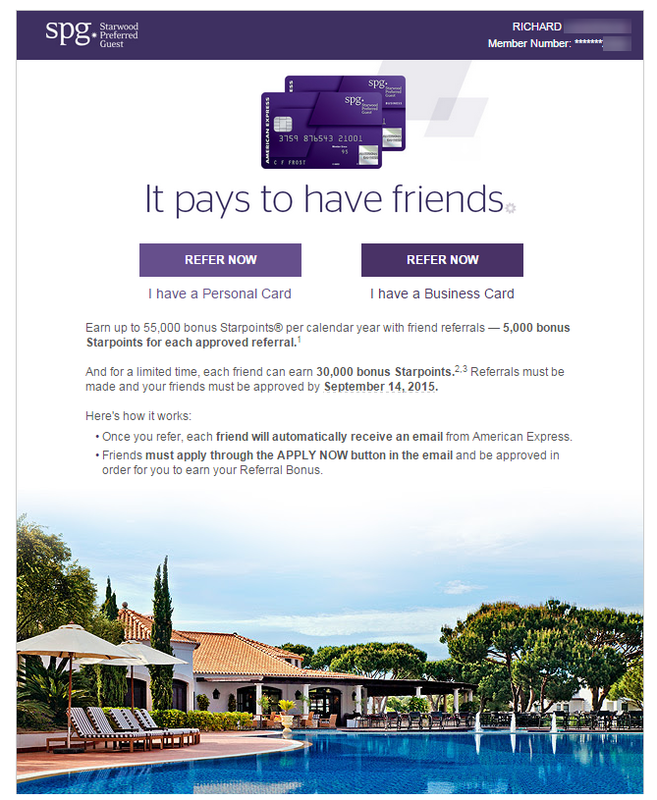 If you're a points and miles enthusiast, chances are you've had a friend ask about "the best credit card" to get. My answer is always, "that depends." I try to determine what their goals are, then recommend a card that I think would work best for them. 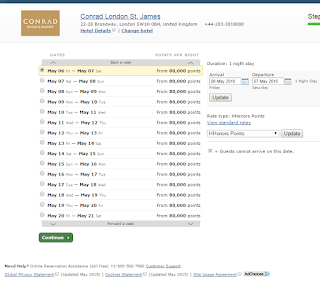 This is equal to the current best available offer, plus you get points for referring your friend/spouse/colleague, etc. In such cases you're leaving points on the table if you don't remember to make a referral. 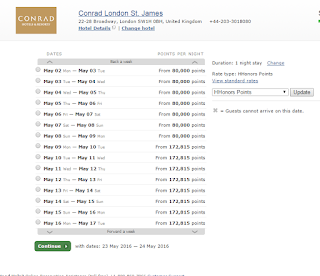 Amex Gift Cards and Manufactured Spending- How Long Can it Go On? UPDATE: It seems that the answer to my question was: "Not long." Amex has changed their terms with all of the portals that offered cashback on Amex gift cards. Under the new terms only cards with a face value of $200 or less offer cashback. Because the $3.95 activation fee on a $200 card amounts to a 2% premium, this deal is dead for now. 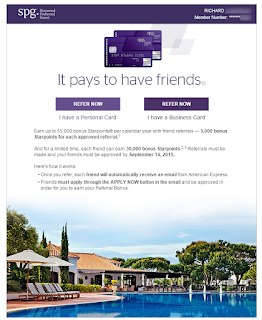 After posting about the current Manufactured Spending opportunity involving the Amex Giftcard Cycle, I read a recent post by one of my favorite points & miles Bloggers: Greg at The Frequent Miler. Greg's post goes a bit more in depth regarding shipping options with Amex and is a "must read." But it got me thinking about how long this MS avenue could possibly go on. As the saying goes: "If something can't go on forever, it wont." The Amex Gift Card Cyle is not quite Greg's El Dorado, the Perpetual Points Machine, but it's close. Since liquidation usually involves around a 1.3% bite, even 1.5% cashback covers your costs (except for time). The real question is how long this can possibly go on and which link in the quasi-PPM will break first. Amex takes a hit on interchange fees when it sells the card, but gets it all back when the card is liquidated (and likely then some). The retailer presumably takes a cut of the load fee for each pre-paid debit card (PPDC) it sells and shares (or passes on entirely) the interchange fee on the PPDC purchase. WU and Moneygram get their fees when money orders are bought. That just leaves Vanilla and the other companies. One can only assume that the PPDC companies are the ones left out in the cold. The load fee, which can be anywhere from $2.95 for lower value cards to $5.95 for variable load cards. An MSer will almost always purchase only $500 cards, meaning that the load cost represents approx. 1%-1.2% of the card's value. It's safe to assume that some portion of that load fee goes to the merchant who actually sells the PPDC. Conversion to reloadable PPDCs. Many PPDC issuers offer the ability to convert a regular PPDC to a "premium" debit card. Those cards often come with increased fees, including monthly maintenance fees. Breakage. This is an industry term for funds that get loaded onto gift cards and PPDCs that simply never gets spent by the consumer. Either the card is lost, forgotten about, or simply has a balance that is too low to make it practical to use. However it comes about, the result is pure profit to the issuer. Source 1: Load fees are invariable. There's no trick, no savvy way to get around them, they're a fact of life. But even there, a savvy MSer is going to get the most bang for his buck, giving up only (at most) 1.2% of the card's value. But for every MSer maxing out a variable load there are X casual users paying a much higher percentage. A $200 fixed value card may carry a $6.95 fee (3.475%). When grandma buys a $25 card as a gift, she may pay a $3.95 fee (15.8%). A fee over 10% of the card's face value is huge. Not in itself, of course, but in the aggregate PPDC companies must be making a lot of money on these cards. Source 2: With MSers, interchange fees are minimal. When PPDCs originally came out, they were technically "debit" cards, but could only be used for signature based (credit) transactions. Signature based transactions come with higher interchange fees, thus the PPDC company earned more revenue on the cards. With the advent of the Durbin Amendment to Dodd-Frank, all that changed and PPDC issuers had to start making PINs available. So now most PPDCs can be used for many PIN-based transactions (such as the purchase of money orders). Presumably most casual users of PPDCs likely use the PIN feature seldomly, if ever. Each card will be used for a single PIN-based purchase. The fee amounts to "21 cents plus 0.05 percent multiplied by the value of the transaction, plus a 1-cent fraud-prevention adjustment, if eligible." So, for a, say, $500 PIN-based transaction, the fee would be either 46 or 47 cents (approx. 0.09%). Not a lot of return there. Source 3: I'll go out on a limb and speculate that virtually no MSers convert to "premium" cards. And if they do, its probably because there's a good reason to (and one that the PPDC company won't like). Source 4: Since MSers typically liquidate cards almost immediately after their purchase, there's little chance of breakage in MSing. In the final analysis, I speculate that MSing is not profitable for PPDC issuers. If I had to pick a number <wild speculation> I'd say they are losing around 2% on each MS-type sale </wild speculation>. How long can this go on? Probably as long as MSing stays small enough that it gets lost in the noise (and much higher profits) generated by casual PPDC purchasers. Figuring out exactly how long that is is left as an exercise for the reader. 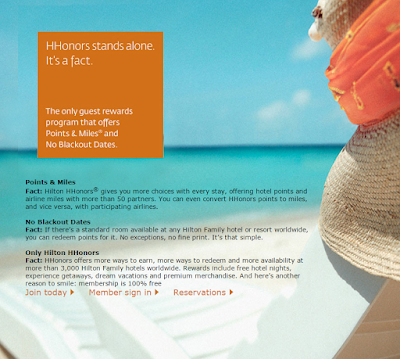 Hilton's "No Blackout Dates" Promise - What's it really worth? And that availability extends throughout the summer. 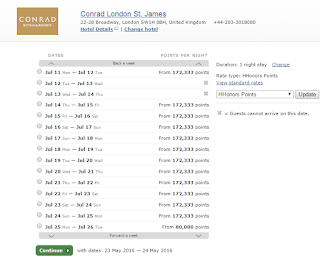 So, despite Hilton's Guarantee, the St. James went from not having one single night available at the standard award level to having every single night available. For what it's worth, Hilton's call center was also reporting that every single superior room was booked when I checked a month or so ago. Unless the Sultan of Brunei had booked all the "Superior" rooms to house his entourage during the summer and just decided to cancel, something hinky was going on. 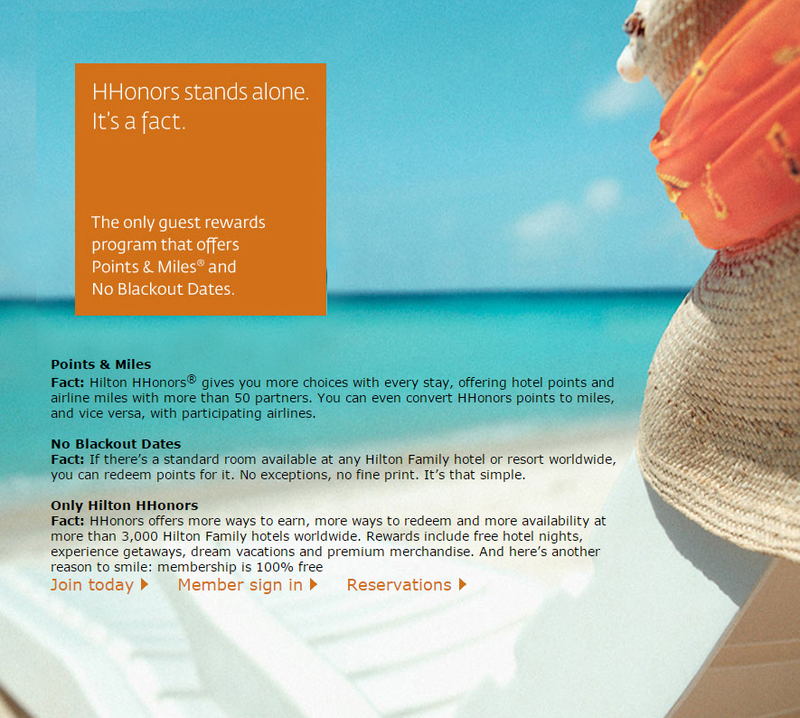 Hilton is very proud of the fact that their frequent guest program, Hilton Honors, has "no blackout dates." Says Hilton: "Fact: If there’s a standard room available at any Hilton Family hotel or resort worldwide, you can redeem points for it. No exceptions, no fine print. It’s that simple." That's right. 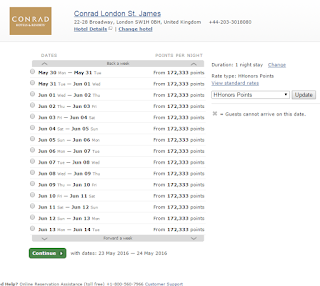 According to Hilton, every single Superior room at the St. James is booked from May 9 to July 24, nearly three solid months. 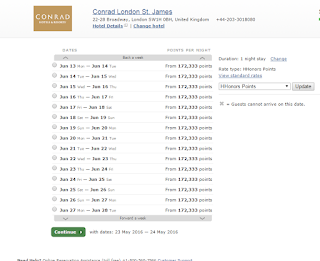 While it's possible that this is true, it seems unlikely that there wouldn't be one single night available for a standard points redemption. 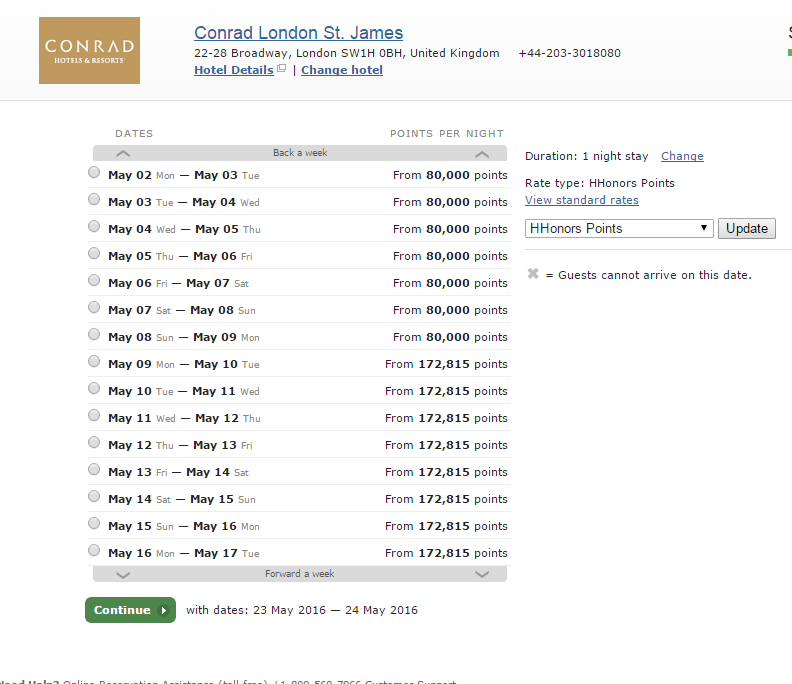 I suspect that the St. James, which is new to the Hilton brand, may be trying to protect it's high season revenue by blocking their Superior rooms, thus effectively blocking points bookings. Or maybe it's all just an innocent mistake. 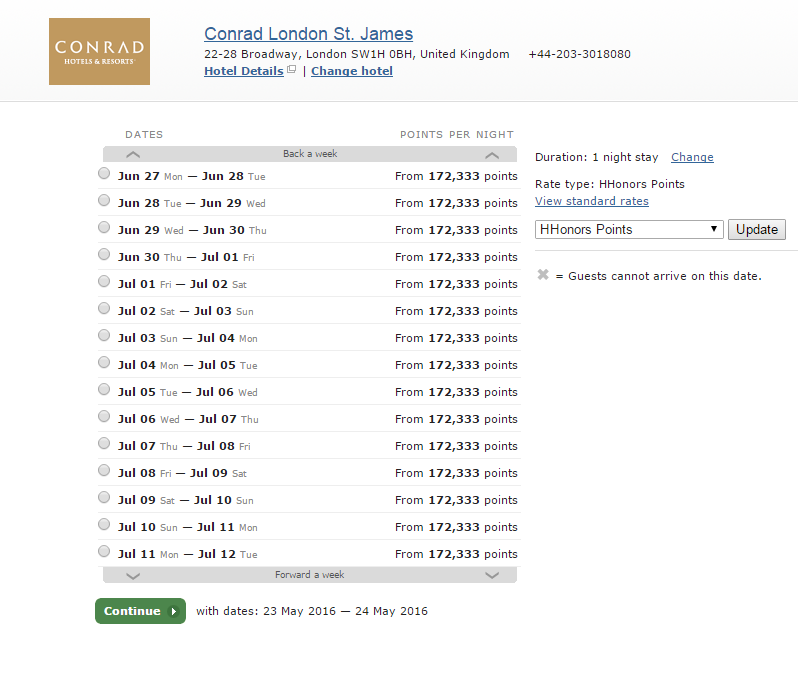 Or maybe some company has booked every standard room for a three month conference. Or maybe the moon is made of green cheese. 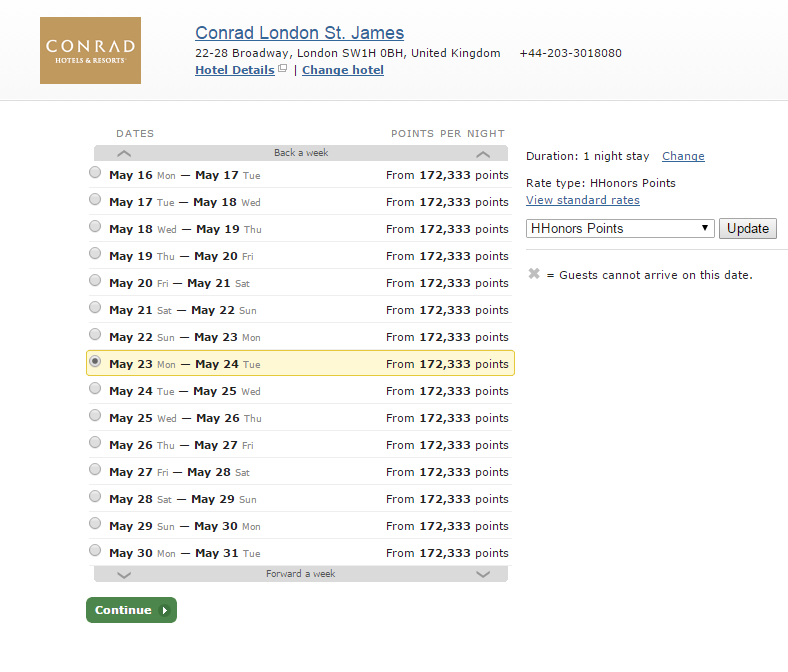 Anyway, I've reached out to Hilton via e-mail with no results. I'll try Twitter next. 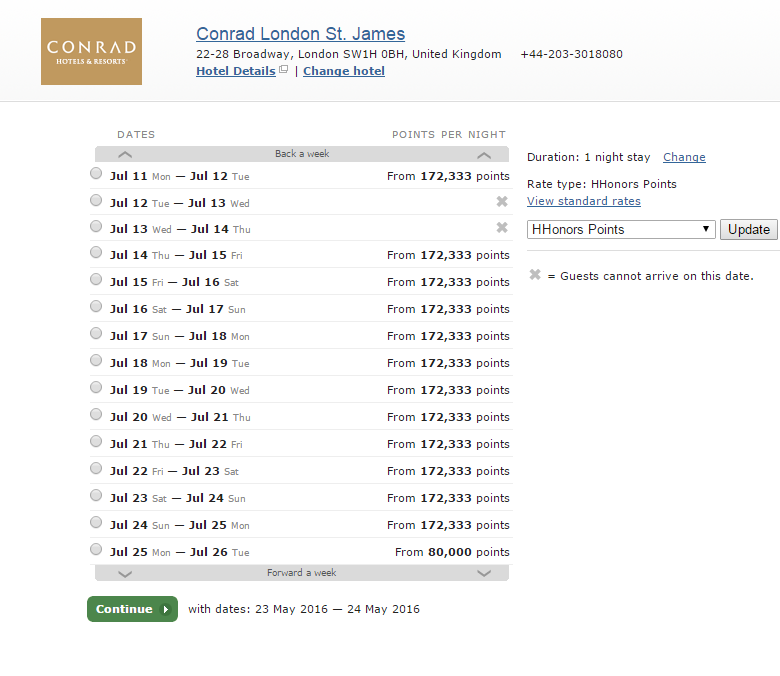 Sure, I could spend an extra 92,000 points per night for a "Premium Room Reward" in a King Deluxe Room. 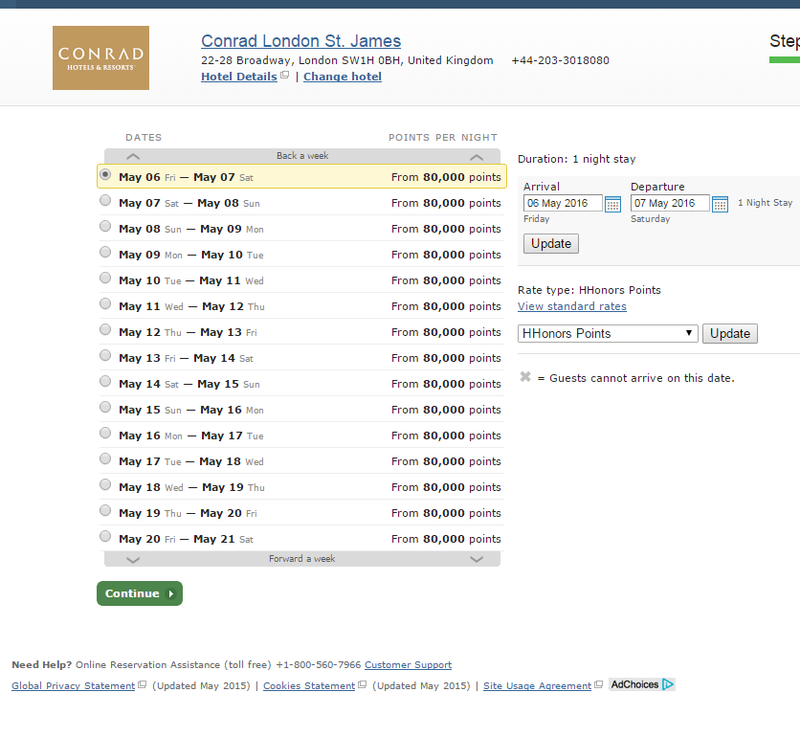 But that's a horrible value for a room that only runs around £50 more per night than the Superior rooms (approx. £350 vs. £400).